Today’s FortunateBluFrog post takes me back to my early work days. I sometimes thing that I’ve been working my entire life. Which of course is not true, but it is pretty close. I can remember helping to clean the Cape House with my sisters and mother after guests left, the house is a B&B. At 10 I would mow the lawns around the neighborhood. Younger than that I was stuffing the Sunday inserts into the papers at the Candy Store. At 13 or 14 I was working for my “grandmother” at the Dairy Tower. I was too young to be legally employed. And that is not to mention all the construction/destruction/clean up work I did with my Dad over the years. I’ve always had a job. How many of you have heard that before? I heard that often and in many of my jobs, Ice Cream Server, Short Order Cook, Fry Cook, Pizza Delivery, Gopher and one of the Bennett Kids. That last one is what shaped my entire work ethic. Working for my Dad was one of those life experiences that while I was doing it I didn’t totally appreciate it but now that I look back I can see where those experiences were so important. My Dad is all about quality. That wasn’t something that Dad said or anything but the meaning was in the actions. We never left a work site dirty, never. Each day we would unload the tools do the work and then clean everything up. We never left up equipment or tools lying around, even in our own house, everything was packed up and put out of the way, things were swept up or raked up too. That was usually my job, which taught me an important lesson about having pride in my work. Is Cleaning Up That Important? Think about it this way. Suppose you shingled someone’s roof and it came out fantastic but you left all your tools strewn about the lawn. You might have put a few of the big pieces of old shingles into the dumpster, but you didn’t rake up and you left the yard a mess. What do you think the homeowner will see first? Will they see the well crafted shingling job on the roof or will they see the mess on their front lawn? If you answered roof then you are in for a rude awakening some day. They’re going to notice that you didn’t take the time to clean up and be more careful, and because of that they will question the quality of the job you did on the roof itself. What Does Cleaning Up Have to Do With Blogging? Your blog is a reflection of who you are. If you craft great posts but don’t bother to edit or check spelling then your readers may be turned off. If you do not bother to write an about page, edit your theme to make it your own or fail to update your blog often it won’t matter what you write because those are the things people will see first. If your blog is a mess of ads and your content is hidden then it won’t matter how good your content is if no one can see it through the mess of advertising. What Else Needs Cleaning Up? Here is one that I was guilty of. How many categories do you have on your blog? I believe that it was at IZEAFest that I learned that I should have no more than 20 categories on my blog. Well, if you look at my right sidebar I added the widget for Categories. It is right below the tagcloud of my tags. You’ll notice that my largest tag is uncategorized. Then you will see a really long list of categories. What a mess! For categories to be a useful navigation tool you really should limit them to no more than 20. Tags should be used to further define a post. Right now I have 3,845 posts in 425 categories and 3,768 tags. The number of posts is great, I’m getting close to 4,000 so that is cool. I need to whittle down the categories and I also need to make sure that none of my posts are without tags. Did you notice that the word Uncategorized? It is huge and it breaks my theme by adding a slider to the bottom of the browser. So that needs to be fixed. It bugs me but I leave it to remind me that I need to go through all 3,845 posts (less than that because I’ve been pretty good about categories and tags for the past few months) tag them and put the posts into my 20 specific categories. Also by going back through each of these posts I can properly add information to the plug in All In One SEO Pack. I may not “have” to do this but I think that if I make my blog as “clean” as possible I and you can focus on the content of this blog and not the junk on the lawn. 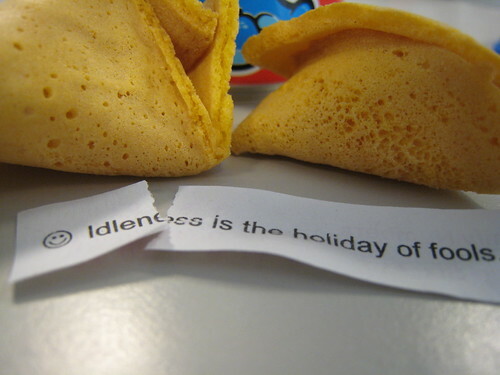 I really love your fortune cookie posts. I’ve never really thought too long and hard about my ‘fortunes,’ but your posts are a great example of putting in the time to reflect and improve, all from a little cookie. Good luck categorizing your posts, it’s time consuming but will be worth it! I love how these little posts have help me just go wild with ideas. I just read the fortune and start writing. It has been fun. I just recently went through and cleaned up all my tags. It’s much easier to navigate around my blog now. Babas last blog post..Win A Twitter Tee! I have a long road ahead of me there to make sure that my stuff is cleaned up. Grr, thanks for the reminder. I’m going to get cracking on that.